Cardan shafts (which are frequently used to compensate for parallel misalignment between driving and driven shafts) are often poorly aligned. The most common cardan shaft set-up is the Z-configuration where the drive shaft and driven machine are horizontal and parallel to each other. Angular misalignment between the shafts cannot be absorbed. so if this is present it typically results in increased vibrations, which will cause the driven shaft to rotate unevenly. The problem, at least until recently, has been that offset drive alignment was a time consuming and tricky affair. A number of methods have been used, ranging from pairs of wires suspended in oil, long brackets, scaffolding poles, theodolites and engineer's levels. All can be used with some degree of success, but correction is mainly a process of trial and error, which demands considerable time and experience to achieve acceptable results. The main difficulty is that the alignment may have to be made between shafts separated by some distance and is often made even more difficult due to the limited ability to rotate one of the shafts. ldeally, in any shaft alignment, we should be able to rotate both shafts. ln applications where cardan shafts are used, we are presented with a special problem. Even if we can rotate both shafts, it inevitably means that we have to move the reference after each rotation. The arrival of dual-laser systems means that this task can actually be a lot simpler than conventional shaft alignment, providing some basic techniques are applied and some simple rules are followed. 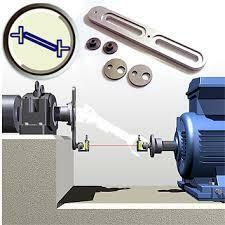 Often the only datum surface we can use is the face of the flange, which is also utilized in the cardan shaft fixture. The alignment's accuracy relies on using the face of the coupling as a datum surface and the squareness of this face to the axis of rotation. Step forward the Fixturlaser NXA Pro with its Cardan shaft alignment application. This allows quick and easy measuring of the parallelism of cardan shafts. 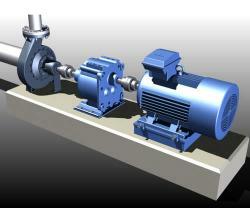 The fixture system allows a dummy rotational axis to be set parallel to the driven unit (stationary machine). The fixture is adjustable in a plane parallel to the flange face to create a parallel rotational axis to be set at any offset from the driven unit. The fixture can be mounted on either unit depending on the space available, but it is always easier to mount this on the shaft which cannot be rotated (stationary machine). Carrying out the actual alignment is a simple process that is usually achieved in minutes. When cardan shafts can not be rotated measurement is still possible using our "offset brackets". These allow the operator to position the rotating axis of the stationary machine at the same level as the motor drive shaft. Then as usual the shafts can be rotated and the Laser system does all the calculations for you.